This unit provides an introduction to the monitoring of air, water and soils. It provides hands-on and industry relevant experience in the tools and techniques for conducting a multi-disciplinary environmental assessment. Techniques for the design, implementation and analysis of monitoring programs are examined. To increase the successful implementation of monitoring programs in management protocols, skills in science communication and ways to use science in decision-making are developed. 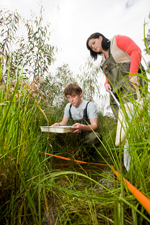 During this unit students will implement an environmental monitoring program by conducting environmental monitoring and analysis to generate a report on the state of the environment at Monash University. Evaluate and integrate theory drawn from several disciplines and use a range of communication techniques to describe the results of environmental monitoring surveys to a broad audience.